Buying a new home just prior to having a baby could potentially be one of life’s most stressful experiences. However, for one young couple, Ryan Bartholomew and Jen Mather, (aged 28 and 27) who purchased a brand-new home in just four weeks just before the arrival of their son Josh, the process could not have been easier. The new parents bought a stylish two-bedroom apartment in Bracknell at Hodson Developments’ Fitzroy Collection and, thanks to Help to Buy, they now even pay less in their monthly mortgage than they were previously paying in rent. 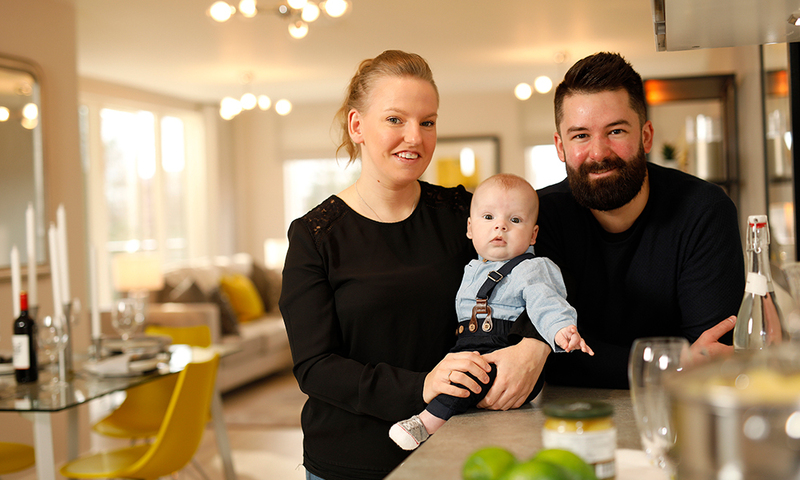 Now baby Josh is five months old, the family are very settled in their new ground-floor garden apartment at the Fitzroy Collection in Bracknell, and say that life couldn’t be better. Purchasing with Help to Buy, the couple only needed a 5% deposit to purchase their brand-new home at the Fitzroy Collection. The popular Equity Loan scheme meant that the upfront cost of purchasing was much less than it might otherwise have been with only a 5% deposit required. Additionally, their monthly repayments are comparatively lower because the 20% Equity Loan available with Help to Buy means that purchasers can access interest rates more typically available with a 75% Loan to Value mortgage. The Fitzroy Collection is a stylish collection of new apartments by award-winning developers, Hodson Developments, which is now 60% sold. Featuring spacious one, two and three-bedroom apartments and stunning penthouses, the Fitzroy Collection is a private, exclusive development set over two luxurious buildings. It offers individually designed apartments with superior specification as standard, and is set in beautiful landscaped grounds. Situated close to thriving Bracknell town centre which is currently undergoing a £250 million regeneration, the town has recently seen the arrival of the multi-million shopping centre, The Lexicon. Less than a five-minute walk to the train station, the couple (who both work in London) will benefit from an easy commute, with services running into Waterloo in under an hour. New to Bracknell, the family are also enjoying discovering the town’s plentiful amenities right on their doorstep. A limited number of one, two and three-bedroom garden apartments, apartments and superb penthouses are currently available at the Fitzroy Collection where prices currently start from £264,950. With Help to Buy, this means that a deposit of just £13,250 is required to purchase one of the stylish apartments. To find out more about purchasing one of the remaining apartment at the Fitzroy Collection, visit our sales and marketing suite on Old Bracknell Lane West, Bracknell, Berkshire, RG12 7FS. Alternatively, give us a call on 01344 481893 or view the Fitzroy Collection here.